Thank you to Lay's for sponsoring today’s post. All thoughts and opinions are my own. I don’t always remember everything about holidays past, but I do know my favorite holiday parties have always been ones involving a white elephant gift exchange. Please tell me you have been involved with one of these before, because they are SO much fun! Even when you get stuck with the worst gift there, it’s still somehow fun! It also provides lots of entertainment for everyone while simultaneously taking the pressure off the whole gift-giving thing (since the gifts don’t need to be perfect or specific to one person). Really, it’s a win-win situation all around. 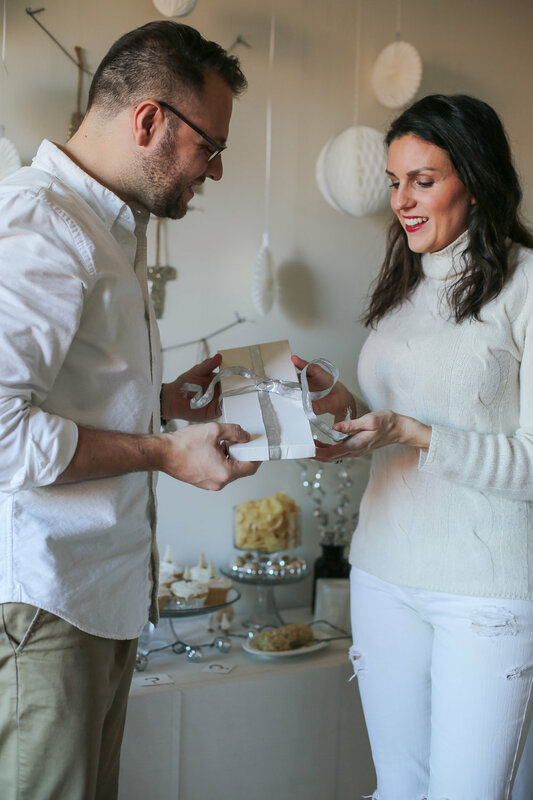 If you’ve never participated in a white elephant exchange party before, here’s the scoop. Everyone brings a wrapped gift (it’s helpful to set a spending limit, usually something like $20-$30 is a good price range). Then, everyone takes turns picking a gift. After that, people perform actions from a selected card pre-written by the host. 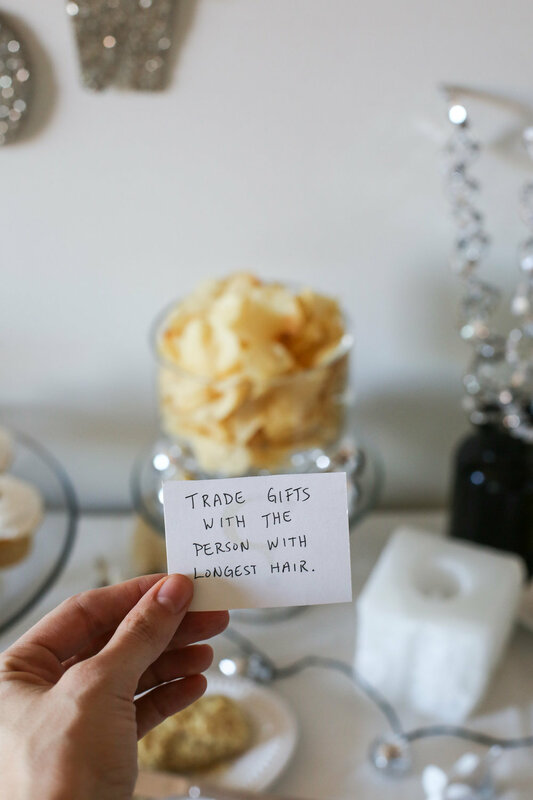 For example, cards could say things like “Switch gifts with the youngest person in the room.” After everyone has had a chance to play a card, you can finally open your gifts (see some examples of gift ideas below). As much as I love these type of parties, believe it or not, I’ve never actually hosted one. But that’s all changing this year. 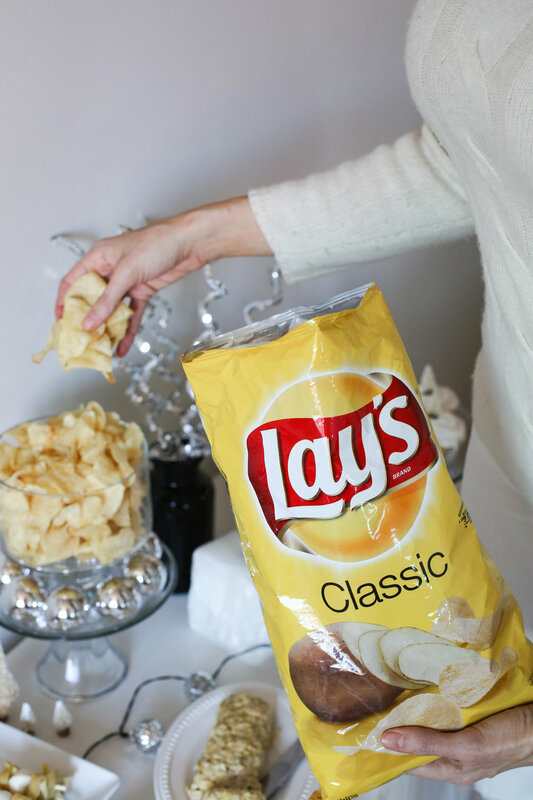 I’ve partnered with Frito-Lay to show you just how I’m hosting my own white elephant exchange party and how you can, too. For me, I take themes pretty seriously, embracing them to the absolute fullest. 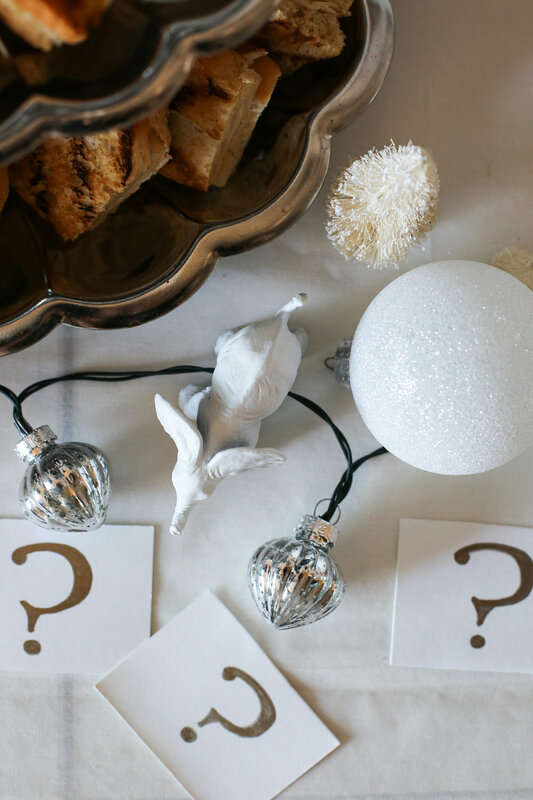 Since this party is called a white elephant gift exchange and it takes place during the winter, I decided on a winter white wonderland theme, complete with, what else, but white elephants. Keeping within a specific theme and color-scheme not only makes things look uniform, it also makes it much easier to put together. For the décor, I laid out a plain white tablecloth. I used a variety of lights, white and silver ornaments, snowy trees, and crystal candleholders to decorate the tablescape. However, my favorite decorations have to be the actual white elephants. I simply picked up a couple of plastic toy elephants and spray painted them white. 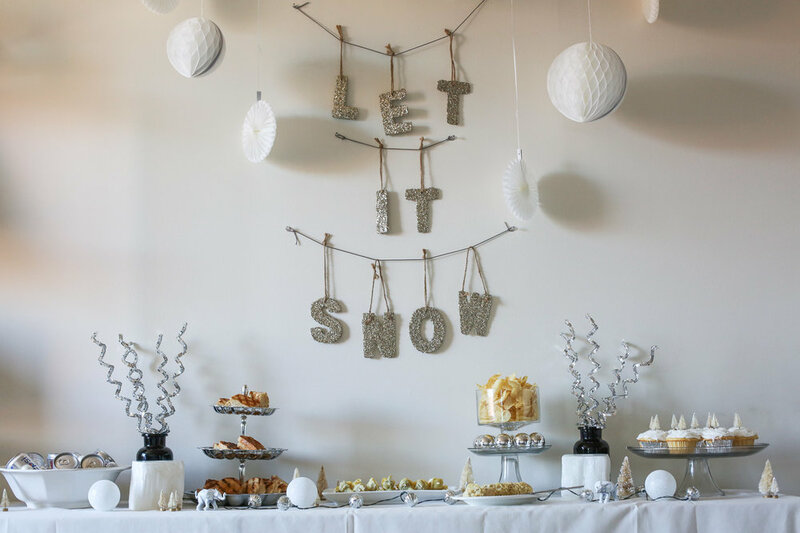 They add a fun and cheeky element to the table and even double as a party theme reminder, just in case anyone forgets ;) Above the table, I strung up glitter letters to spell out “Let it snow” and also hung up crepe paper balls to complete the scene. Last but not least, I added in a metallic tree for the designated gifting corner. The best part is that all of these decorations are easily found at your local craft or party store. Moving right along to the food and drinks, I kept the winter white wonderland theme going with a bevy of snowy-hued snacks. Bite-sized turkey and Swiss grilled cheese sandwiches (can be made ahead and reheat in the oven right before serving), Lay’s Potato Chip crusted goat cheese that had been mixed with sautéed onions and garlic and balsamic vinegar (can be made in advance and kept covered in plastic wrap, in the refrigerator) and served with Lay’s Classic Potato Chips and mini skewers with baby mozzarella balls, marinated artichoke hearts and cheese tortellini (drizzle with olive oil to keep these skewers fresh) rounded out the savory menu. For dessert, we utilized the surprise element of the gift exchange to create surprise cupcakes. We simply prepared vanilla cupcakes, baked them for half the amount of time, popped a Nut Harvest Dark Chocolate Toffee Bite into the center of each one and finished baking them. Once the cupcakes were baked, we let them cool and frosted them as usual. We then topped the cupcakes with mini white trees and a dusting of “snow” aka edible white glitter. 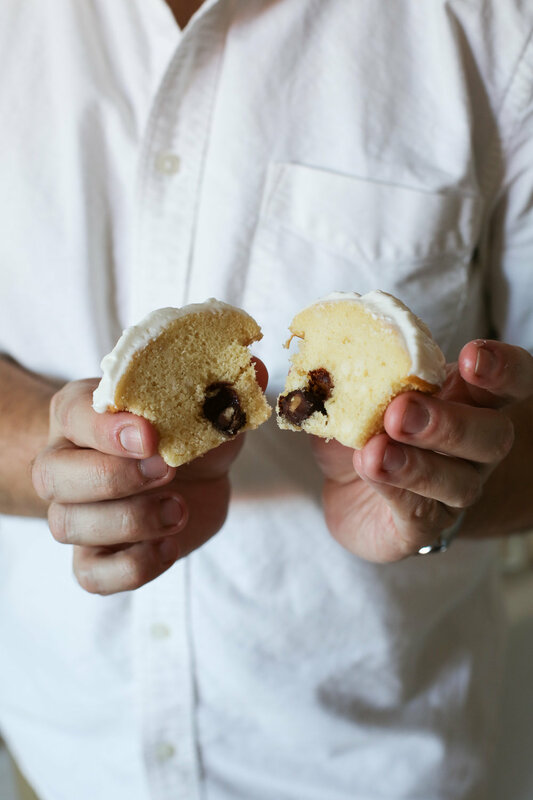 While they look like ordinary cupcakes, biting into them reveals that they are anything but. Last but not least, we kept drinks simple with Pepsi 2 Liters, Mini Diet Pepsi cans and Budweiser 8-packs. 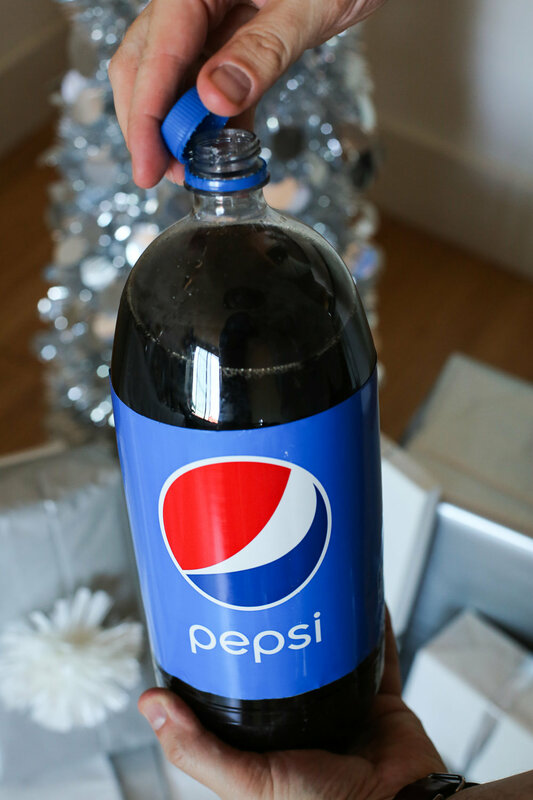 To jazz up the ice bucket, toss in some festive ornaments (just make sure they’re the plastic, non-breakable kind). 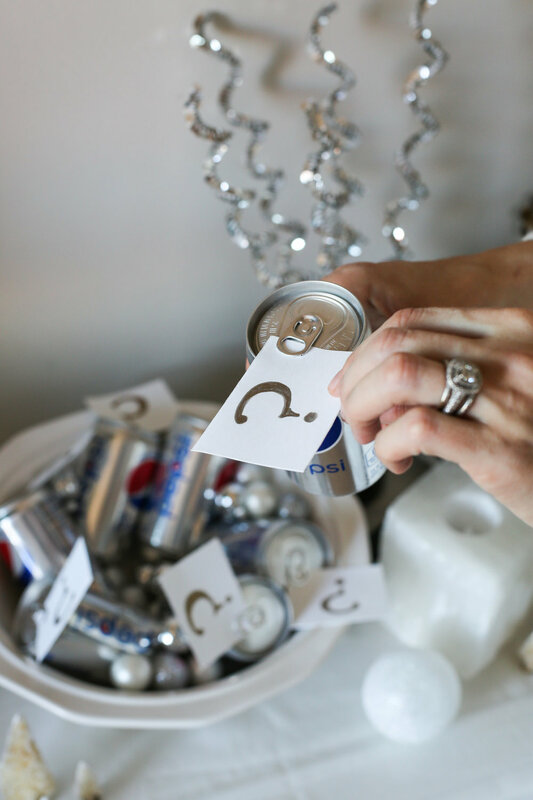 Include the drinks in the party-theme fun by placing the gift exchange clue cards (examples below) on the tops (or bottoms, if you aren’t keeping drinks in an ice bucket) of the beverage cans. For more holiday party tips and tricks, check out www.pinterest.com/fritolay.